The first hegemon was Duke Huan of Qi (r. 685–643 BC). With the help of his prime minister, Guan Zhong, Duke Huan reformed Qi to centralize its power structure. The state consisted of 15 “townships” with the duke and two senior ministers each in charge of five; military functions were also united with civil ones. These and related reforms provided the state, already powerful from control of trade crossroads, with a greater ability to mobilize resources than the more loosely organized states. By 667 BC, Qi had clearly shown its economic and military predominance, and Duke Huan assembled the leaders of Lu, Song, Chen, and Zheng, who elected him as their leader. Soon after, King Hui of Zhou conferred the title of bà (hegemon), giving Duke Huan royal authority in military ventures. An important basis for justifying Qi’s dominance over the other states was presented in the slogan ‘supporting the king, and expelling the barbarians’ (尊王攘夷 zun wang rang yi); the role of subsequent hegemons would also be framed in this way, as the primary defender and supporter of nominal Zhou authority and the existing order. Using this authority, Duke Huan intervened in a power struggle in Lu; protected Yan from encroaching Western Rong nomads (664 BC); drove off Northern Di nomads after they’d invaded Wey (660 BC) and Xing (659 BC), providing the people with provisions and protective garrison units; and led an alliance of eight states to conquer Cai and thereby block the northward expansion of Chu (656 BC). At his death in 643 BC, five of Duke Huan’s sons contended for the throne, badly weakening the state so that it was no longer regarded as the hegemon. For nearly ten years, no ruler held the title. Duke Xiang of Song attempted to claim the hegemony in the wake of Qi’s decline, perhaps driven by a desire to restore the Shang Dynasty from which Song had descended. He hosted peace confences in the same style as Qi had done, and conducted aggessive military campaigns against his rivals. Duke Xiang however met his end when, against the advice of his staff, he attacked the much larger state of Chu. The Song forces were defeated at the battle of Hong in 638 BC, and the duke himself died in the following year from an injury sustained in the battle. After Xiang’s death his successors adopted a more modest foreign policy, better suited to the country’s small size. As Duke Xiang was never officially recognized as hegemon by the King of Zhou, not all sources list him as one of the Five Hegemons. When Duke Wen of Jin came to power in 636 BC, he capitalized on the reforms of his father, Duke Xian (r. 676–651 BC), who had centralized the state, killed off relatives who might threaten his authority, conquered sixteen smaller states, and even absorbed some Rong and Di peoples to make Jin much more powerful than it had been previously. When he assisted King Xiang in a succession struggle in 635 BC, Xiang awarded Jin with strategically valuable territory near Chengzhou. Duke Wen of Jin then used his growing power to coordinate a military response with Qi, Qin, and Song against Chu, which had begun encroaching northward after the death of Duke Huán of Qi. With a decisive Chu loss at the Battle of Chengpu (632 BC), Duke Wen’s loyalty to the Zhou king was rewarded at an interstate conference when King Xīang awarded him the title of bà. 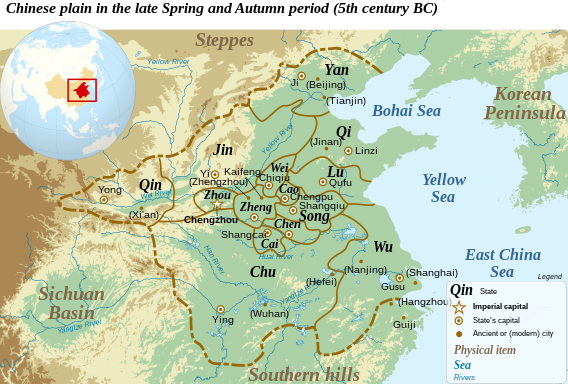 After the death of Duke Wen in 628 BC, a growing tension manifested in interstate violence that turned smaller states, particularly those at the border between Jin and Chu, into sites of constant warfare; Qi and Qin also engaged in numerous interstate skirmishes with Jin or its allies to boost their own power. Duke Mu of Qin had ascended the throne in 659 BC and forged an alliance with Jin by marrying his daughter to Duke Wen. In 624 BC, he established hegemony over the western Rong barbarians and became the most powerful lord of the time. However he did not chair any alliance with other states nor was he officially recognized as hegemon by the king. Therefore, not all sources accept him as one of the Five Hegemons. King Zhuang of Chu expanded the borders of Chu well north of the Yangtze River, threatening the Central States in modern Henan. At one point the Chu forces advanced to just outside the royal capital of Zhou, upon which King Zhuang sent a messenger to ask how heavy and bulky the Nine Cauldrons were; implying he might soon arrange to have them moved to his own capital. In the end the Zhou capital was spared, and Chu shifted focus to harassing the nearby state of Zheng. The once-hegemon state of Jin intervened to rescue Zheng from the Chu invaders but were resolutely defeated, which marks the ascension of Chu as the dominant state of the time. Despite his de facto hegemony, King Zhuang’s self-proclaimed title of “king” was never recognized by the Zhou states. In the Spring and Autumn Annals he is defiantly referred to by the Chu ruler’s original title “viscount” (the second-lowest noble rank), even at a time when he dominated most of south China. Later historians however always include him as one of the Five Hegemons.